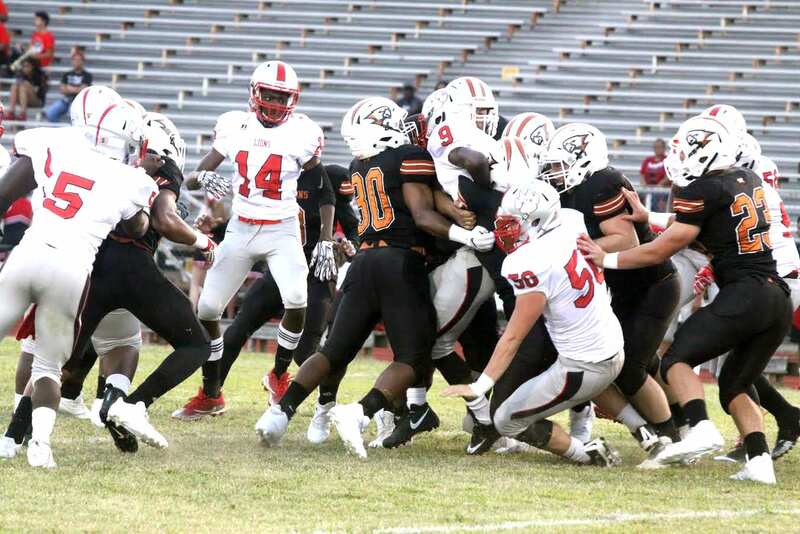 Friday was a tough night for the Parkway Panthers, Bossier Bearkats and Plain Dealing Lions. Playing a full game for the first time without both of its injured stars, senior quarterback Justin Rogers and senior receiver Terrace Marshall Jr., Parkway lost to three-time defending Arkansas Class 5A state champion Pulaski Academy 62-21 in Little Rock. Bossier fell to defending Class 1A state champion Logansport 48-21 in Logansport. Plain Dealing, a Class 1A school, lost to District 1-4A’s Northwood 42-0 at Northwood’s Jerry Burton Stadium. Pulaski Academy 62, Parkway 21: The Panthers simply had no answers for the Bruins’ high-powered offense. Behind the running and passing of junior quarterback Amani Larry, Parkway moved the ball well at times in the first half but trailed 42-14. Pulaski came into the game averaging 57.5 points per game. The Bruins (3-0) won their 15th in a row. Parkway (1-2) begins District 1-5A play Friday at home against defending district and Division I state champion Evangel Christian. The Eagles (1-1) did not play Friday night. Logansport 48, Bossier 21: The Bearkats got off to a good start, marching 60 yards in 14 plays for a touchdown on their first possession. Isaiah Wallace-Blair’s 3-yard TD run and Rico St. Fleur’s PAT gave Bossier a 7-0 lead with 5:43 left in the first quarter. But Logansport scored 34 unanswered points the rest of the half, including 22 in the second quarter. The Tigers (3-0), who led 48-14 after three quarters, won their 17th straight game. Wallace-Blair, who led Bossier with 165 yards on 17 carries, scored on a 9-yard run in the third quarter. He also completed a 32-yard TD pass to Jerry Rayson in the fourth. Quinton Smith rushed for 74 yards on 15 carries, and Xavier Venious had 36 on six. Bossier (2-1) opens District 1-4A play at Benton on Friday. The Tigers (3-0) defeated Tioga 48-16 Friday night. Northwood 42, Plain Dealing 0: The Falcons (2-1) were too much for the young, outmanned Lions, scoring six TDs in the first half.